Ever been to another website and wanted to leave a comment on an article or post somewhere and didn't want to go through the lengthy account creation process? Did that account creation process turn you off from leaving your comment? Did you ever think to yourself, "oh man, in this era of social media, I wish this site had Facebook integration set up like every other website in the world," and move along without sharing your thoughts or sharing the content back to your own Facebook wall? All of those are rhetorical questions, but you wiseasses are free to answer if you'd like. We've enabled the integrated Facebook support that is native to this version of vBulletin, and are looking into mod support for Twitter and Google logins as well. I still need to do some testing to ensure everything is flowing smoothly, but ideally this means that we can help direct some of the homepage traffic into the forums by creating a simple, two-click account setup that allows potential users to start posting within seconds, rather than minutes. And this also means the "like" functionality is back - AND you don't have to have a fb account connected in order to use it. The only downside is that the button will appear over threads, blogs, and articles, but not within individual posts. Currently, it looks like the "Connect with Facebook" buttons just redirect to whatever current page the user has loaded. I'll look into that over the weekend, but the Like and Share buttons are working as intended. There seems to be a hurdle with instant posting. In the AdminCP, I have a few bypasses enabled that should allow a user to be ready to go via an auto-registration feature, yet this does not appear functional in practice. I'll keep digging, but I may not resolve this before I head to bed tonight. Last edited by LocoColt04; 10-01-2016 at 01:14 AM. It required me to create a password, enter an email, and acknowledge the forum rules twice, once at registration and again before I could do my first post. That is not "two-click" account creation. I updated the mod that we utilize which forces the acknowledgement. There are specific instances under which it will still kick in, but now it won't force the secondary confirmation screen unless a user commits an infraction of the rules or someone on the staff forces the verification to go through. Last edited by LocoColt04; 10-01-2016 at 02:23 AM. Hmm, I don't think I like the "Like" and "Share" buttons on each individual blog post. Actually, I don't like it at all. Some people, like me, may not want their Facebook friends finding out they are being mentioned online somewhere, especially if TFF friends overlap into Facebook and they accidentally or purposely Share or like an entry. Is there no way to make Blogs immune to this? Or do the privacy settings still make it mandatory to be a member to view entries? I got so far as the Share Post screen, but didn't actually post it (because I am too lazy/afraid to hit the post button). I can turn off the Blog connectivity, since it's pointless because of our privacy settings for those anyway. I left it on because I'd honestly forgotten that we had them restricted. I will leave the Like button in place, though. That doesn't hurt anything and Likes aren't shared back to Facebook - and they can be used without even having a Facebook account. Speaking of the Share buttons, I can turn them ON for individual posts, if you think that's a thing people would utilize. Just chiming in that I'm glad you got this enabled again. It seems I see the FB integration on almost all popular boards, discussions, etc, so the vast majority of users should be familiar with it! I'll continue to look into Twitter and G+ integrations but I think FB is obviously the most popular option for the time-being. Hello everybody. Played at 1xbet casino now links do not work. 1xbet link was blocked. How to log in now? I have no clue! Welcome to the forums, adizzy! I hope you enjoy the Facebook integration of our Final Fantasy forums, and hope that the links work someday at the 1xbet casino! 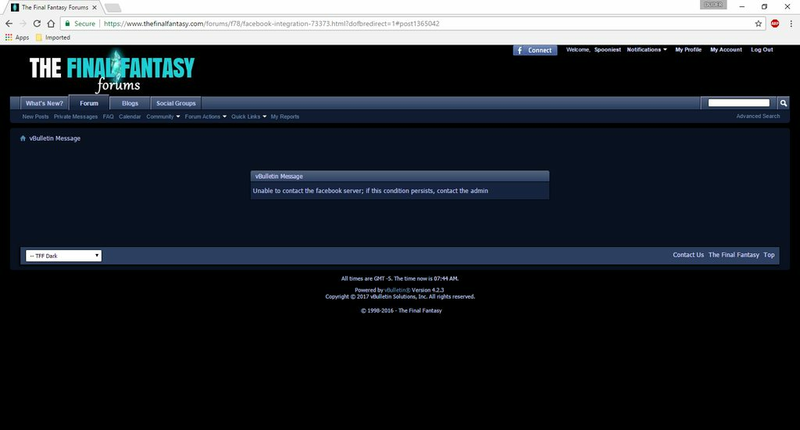 This is what happened when I tried to connect my facebook account, I'm not even sure if registered users can or not? Uh, this is a little unclear, what this does, to a luddite like me that can only play dern fool music.